By now most people know about this story and this woman. More importantly they know of the phenomenon that this incredible woman’s story has inspired. A woman’s world came apart. She went off in search of herself. She chose three destinations. The first she would focus on her love of food. The second she would focus on her soul. The third she would focus on her heart. She found herself and a new love. 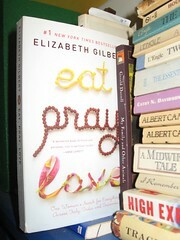 She put it all in a book and she called it Eat,Pray, Love. It resonated with millions of readers. Hollywood picked up the vibes and came calling. Julia Roberts came wooing. A movie was made. The rest is history as they say. Let me tell you why this is one of my favourite books. First answer this question. What makes a book popular? What makes a writer an inspiration? A book must resonate with its readers. It must hook them. It must make them laugh or cry. Readers must recognise parts of themselves in the characters of the story. They must feel a connection with either the writer or the reader. That is what makes a good book. That is what makes you even reread favourite books. That is what makes readers quote their favourite passages from books. All of the above answers are the very same reasons why this book is one of my favourite books. Sometimes reading the correct book is all in the timing and the circumstances that you find yourself in. That was the case with me when I first came across this book. I won’t go into the gory details here but I will say that I found myself at my lowest. Life had taken a bite from me, chewed me up and then spat me out. Then I came across this book. At the time I was immersing myself in any books I could find in an effort to completely escape from my own life and for a moment to live in a world created fictionally. Initially I thought that Eat,Pray,Love would be the same: pure escapism. I had never heard of the author. But I picked up the book and I started reading. I started the book in the early evening and read right through the entire night. I did not eat and I did not sleep. I read and read. I was enthralled. It was uncanny. Everything I had been feeling for months was written in this book and resonated through Elizabeth’s words. (I use the author’s first name because by the time I was into the second chapter of the book, I felt like I was connected to her. She stopped being an author and became an advisor, a counsellor, a shoulder and a friend.) When I finally reached the end of the story, I cried. I cried not just because the book had come to an end but because I could see a light at the end of my own personal tunnel. This story is a story of one woman’s search for herself. That may sound simple. But isn’t that the same story for you and I. Isn’t life constantly about searching for oneself? This search might wear different masks for different people: For one it may wear the mask of love, for a second it may wear the mask of success, for a third it may wear the mask of happiness, for a fourth it might wear a face of politics. But for all of us the search for something more, something extra to help us make sense of things, the search for what we are supposed to do and who we are supposed to be: this is a universal theme. Just as universal is that life and more accurately emotion is a roller-coaster ride. It throws us up in the air and then brings us down, it speeds up and it slows down. This is the reason why I believe that Eat,Pray, Love has become such a phenomenon. A good writer is a writer who can tell a story but an inspiring writer is a writer who with complete transparent honesty allows us to enter their head space and their heart space. Elizabeth Gilbert is such: the inspiring writer. So I urge you if you have not read Eat,Pray,Love – go get a copy of this book and read it. Even if you have watched the movie, go and get the book. It is in her words on the written page that you will find a voice that resonates. It is in her written words that you will find yourself laughing out loud and crying at the same time. Most of all read this book to learn how to be an honest writer. I would also call Elizabeth Gilbert a diarist. Her thoughts and emotions are so naked and vulnerable that you almost feel like you are reading her diary. It takes courage to write honestly. Elizabeth Gilbert has courage. She does not promise to have all the answers but she writes down all her questions and shares her answers with you, the reader. Take a step into her world. Make it your resolution to be honest and vulnerable in your writing. It is said that if the writer writes with tears streaming down their cheeks, the reader will find tears streaming down their’s. I am reading the book right now. I picked it up thinking I was going to read a travelogue (which I love) but feel like, as you said, I am reading a diary. I admit, I do not like her writing style as much but her narration is excellent.